Nail polish in white, grey/silver, black, yellow and blue. Since all my nails are painted already before I decided to do this blog and tutorials, I have used a replacement for my nails. See that white piece of card? Assume that is my nail okay? 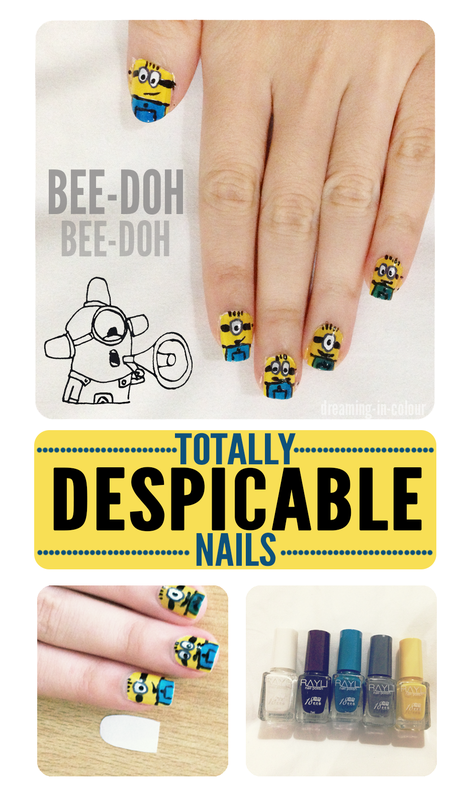 Paint your nail yellow. If your polish isn't very pigmented, you might want to paint it white first, then paint the yellow over. White will always bring out the colour to it's fullest. Take your grey polish and place one or two big dots for the goggle rim. Make it circular, not ovals like what I did. Minions have big circular eyes. Use your black polish to pain the black head bands. Try using the thinner side of your brush if you are having difficulty, and drain the polish first before applying. Use your dotting tool or toothpick to add some hair. Add the whites to the eye. If your grey polish hasn't dried then you can do the next step first and come back to this. Paint the blue minion uniform. Mine is a rectangular shape, so this is easy. Once again, you might want to add a white base before adding the blue. 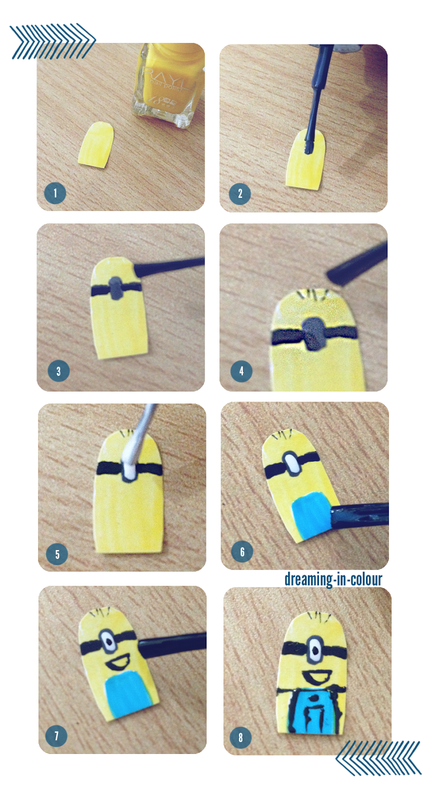 Use dotting tool or toothpick to add in a drop of black polish for the eyeball and draw out a mouth for your minion. Outline the details of the uniform using your toothpick/dotting tool. I normally use the thin edges of my brush to do all my nail art, and occasionally I will use the help of a toothpick. But yes, if you know how to do this too, you can save a lot on nail art brushes. Though the latter will still give a more professional look. Go forth and conquer the world with your minions.